Permalux Coachman Top hat. Available in Black, Brown, or Gray. Sizes: Medium and Large. 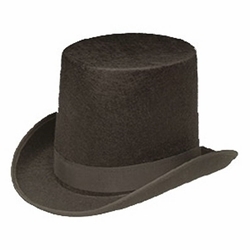 Our coachman hat is a tall top hat with a more narrow tapered shape to its top. This hat is good for many 19th century uses, especially Empire. It works as well for Storybook settings. The coachman hat in gray is a good inexpensive choice for the Ascot scene in "My Fair Lady".